We do a lot of crafts and a lot of seasonal art activities, so it's nice sometimes to do something that is all about the process and all about fun! Bubble painting is a really simple activity to do that kids really enjoy and gives a lot of opportunities for discussion. I started by setting up everything that we would need. I mixed a bit of orange paint and a bit of blue paint in little paint pots with some bubble mixture (you could use dish soap, but we have so many bottles of bubble mixture around!) Then I set it all out in a tray with bubble blowers of different sizes and straws to experiment with. The kids were very excited for this activity, they absolutely love bubbles and mess! I was hoping to do this outside, but as it began pouring rain as we got our supplies ready we had to stay indoors. So I used a large mess mat on the table to keep the bubble mess as controlled as we could (but next time we're doing this on a sunny day!) The kids sat down at the table and chose their first bubble tools. They took a little while to work out how to best use them, but soon got really into it and focused on making great bubbles. I love how much of their own experimenting they began to do, we made our own bubble blowers by twisting pipe cleaners into a loop shape, blew the paint once it was on the page and brushed the bubble blowers along the paper to spread the paint around. In the end their bubble painting picture made a huge masterpiece. We talked about what we could do with it and decided that it might be nice to cut it up into smaller pieces and use it as cards to give our friends. This post is part of a unit study on bubbles! 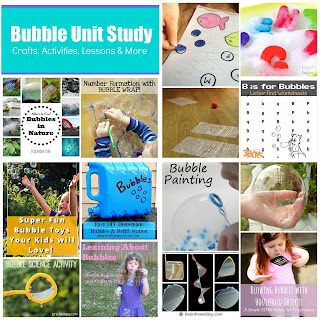 Take a look at all these other fantastic bubble activities!